From a publisher’s standpoint, since its release in late 2008 I’ve considered Second World War at Sea: Arctic Convoy pretty much the perfect product. Yet even perfection can be improved, and that’s what we’ve done with the new Second Edition. To start with, the Second Edition has the Second World War at Sea Second Edition series rules. These are an evolution of the long-standing First Edition, which went into the series’ games for more than fifteen years. Those were very stable rules, easy to understand and use, but over the years we modified them with additions that went into the special rules of each individual game (some of which were repeated over and over in every new game). Now those rules are in the main rulebook, and the scenario book has only a handful of truly special rules applying only to the campaign on which the game is based. All of the basic concepts remain the same: roll a six, stupid. If you know how to play this game, you already know how to play this game. Read the rulebook, see the easier ways to do things you already know, and you’re ready to play. For the second edition, we also added color play aids, those cards where you put your ships and airplanes while their task forces and flights move on the operational map. We also added some additional charts and tables so you don’t have to flip through the rulebook to double-check commonly-used game functions. Likewise, Arctic Convoy’s second edition has full-color airbase and aircraft carrier cards, where you place the aircraft when they’re not flying around. You don’t really need these; the game played exactly the same way with the first edition’s black-and-white cards. It just looks way cooler, and that makes the game more fun to play. Some of the Second World War at Sea second edition games received only cosmetic upgrades (Sea of Iron, Horn of Africa) while others are so altered as to be new games (Eastern Fleet) and others fall somewhere in between (Bismarck). Arctic Convoy would be part of the first group; the map, pieces and scenario set are all still up to standard. Arctic Convoy comes with two maps, covering far northern seas from Iceland to Siberia. They don’t overlap with the maps from Bismarck; the Bismarck maps were drawn using a different global projection. Continuing them to the north resulted in a badly distorted view, and so we went with a fresh projection from the pole to keep Iceland and Archangel at their proper relationship. In practice, that’s no problem at all. Both Axis and Allies saw the Arctic and North Atlantic as completely separate theaters of war. Convoys for North Russia formed up in Iceland, and their escorts worked out of that future center of bank collapse or from Scapa Flow, both of which are present on both games’ maps. Neither merchant nor warships moved directly between them. The Germans based their commerce raiders from some of the same Norwegian ports, but didn’t move them directly from one area to the other, either. Cruisers headed for the Atlantic did so with a full load of fuel. The two theaters are pretty cleanly divided by the Greenland-Iceland-Faroes-Britain line (during the Cold War, NATO put an emphasis on this line for good reason). Writing the story arc and designing the scenarios for the alternative-history expansion The Cruel Sea, with no “real” history to force the action, I still didn’t find any need to cross the line. Arctic Convoy’s maps have all the area needed for operations in the Arctic Ocean, and Bismarck’s have all the needed space for the North Atlantic. 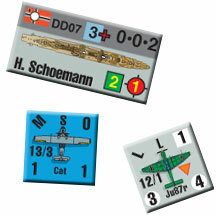 Arctic Convoy includes just over 2 1/2 sheets of playing pieces, with all the expected ships and planes. The Germans don’t have many warships, but then, they don’t really need many. There’s a lot of gray water in which to hide, the weather’s going to protect them from Allied air searches, and they pretty much know where the convoys have to pass. The Allies have most of the Royal Navy, plus a large contingent of American ships and Canadian, Polish and Soviet vessels, too. There’s even a tiny Norwegian element and a lone Australian ship. For once, the Germans have air superiority. Except for some long-range search planes and a small Red Air Force element, the only planes the Allies are going to deploy over the convoys are those they bring with them. Aircraft carriers are vital to cover the merchant ships, yet in the abominable weather they will have a hard time keeping their planes aloft. Scenarios cover the entire stretch of the Murmansk Run, from the fall of 1941 until early 1944. The famous convoy battles are in there: Battle of the Barents Sea, North Cape, PQ.17 and many more. There are also lesser-known actions, like German-Soviet destroyer clashes along the coast of Lapland and the armored cruiser Scheer’s raid along the Soviet north coast. In terms of play, the Allies are trying to push convoys along a known route, in the face of enemy aircraft, surface ships and submarines. The Axis has only limited force, but can concentrate it at a single point. 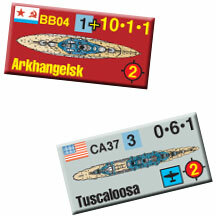 Arctic Convoy has 26 scenarios: twenty operational and six battle scenarios. It’s a good set, almost all of them based on operations and battles that actually took place. That left a lot of room to explore battles and operations that easily could have happened, but did not – in particular, more battle scenarios. With the scenario book already at 60 pages, I decided to let that stand and come back later with a history/scenario book similar in concept to the Jutland: Battle Analysis so I can get all pretentious with the story behind the battles. 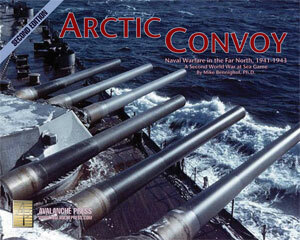 Arctic Convoy is a fine game, filled with historical action in the frozen seas north of Russia. It’s even easier to play with the new rules set, and looks even better on your game table. You need this game, and if you’re in the Gold Club, for a very brief moment you can still pick up all the new stuff (rules, cards, scenarios) separately.